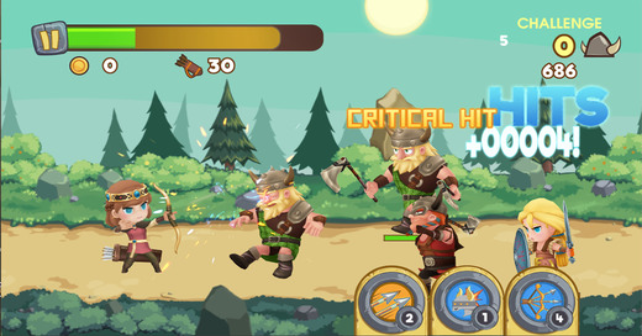 Viking Invaders is a visually-stimulating 3D game that is all about defense and survival. You take the role of Princess Elysande who has been single-handedly tasked to defend her lands from endless hordes of Viking invaders. Equipped only with her bow and arrows, it’s your job to guide the princess’s aim to vanquish her foes and keep her kingdom safe from their barbaric clutches. That being said, players are expected to have a steady hand when playing this game as shooting at your enemies involve holding and tapping at the direction where you want your arrows to fly. This effectively simulates a seemingly realistic way of drawing and letting arrows loose in real life. This is also where much of the skill aspect of the game lies. On the upper left-hand corner of the interface, your health bar will always be displayed. Each time a Viking gets near and attacks the Princess, her health bar will decrease. Directly below the green bar are the gold that you’ve earned as well as the total arrows that you have remaining. These two bonuses that can be picked up are dropped by Vikings by chance. You have to pay careful attention to the total number of arrows you still have as using skills and shooting arrows decrease them based on the number that you let loose at once. This is because at the bottom right-hand corner of the interface, you will notice skills like Multi Shot which expends 4 arrows at once and is able to kill multiple enemies in one shot. Other skills involve powering up your arrows so they would be able to penetrate the armor of the Vikings, letting you kill those that happen to be moving in a straight line. These are but some of the power-ups that you can do within the game. You may use the gold that you’ve earned to buy items and upgrades at the shop. Most of them would either improve the damage of your arrows, enhance your armor, or imbue your arrows with different kinds of magical enchantments to kill your enemies more efficiently. Vikings Invaders is quick to put its other counterparts to shame as it incorporates elements that really require players to actually exercise their skill, quick thinking and reflexes. Much like using a bow in real life, you need to keep your hand steady when aiming and shooting in order to kill your enemies. While its overall setting is in 2D, its 3D characters as well as their respective designs are truly worth highlighting for their unique detail and animation. We can safely say that not a single punch was pulled in their execution.